Join with Me and Ask the Top 10 Retailers to Ban the Hazardous 100+ From Their Store Shelves! What would you give to be able to shop and never have to worry about hazardous chemicals science tells us are detrimental to our health like: Phthalates which are used to soften vinyl plastic and can be found in products like school supplies and have been linked to low testosterone, birth defects and cancer or Parabens in personal care products which have been linked to endocrine disruption and Formaldehyde which is a known carcinogen yet still used to produce many household products like clothing, cosmetics and over 100 more? Scientists have established links between exposures to many of these chemicals and chronic diseases and health conditions, including cancer, infertility, learning and developmental disabilities, behavioral problems, obesity, diabetes, and asthma. I mean seriously, who is minding the store???? Well that is exactly the question that the +Safer Chemicals, Healthy Families (SCHF) coalition is asking and you and I, along with bloggers from all over the Unites States, can get on board to make our collective voices heard and help push retailers to create needed change for our health and the health of our environment! While I was making my own little difference in my backyard at my local Target, I even chatted with some customer service reps and found that they too, are concerned with the chemicals in their food, cosmetics, furniture and other consumer goods. If you are concerned with the negative health consequences science has shown are causing illness among us like asthma, cancer, infertility, learning and developmental disabilities, behavioral problems, obesity, and diabetes then join with us! 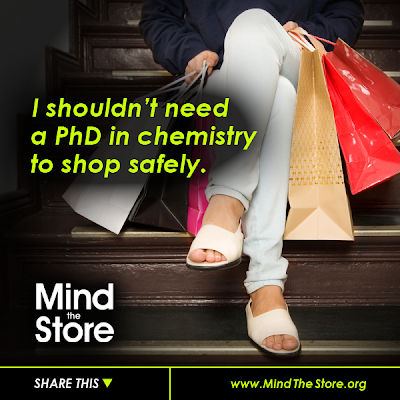 Take a few minutes and tell the top 10 retailers in the US that we want them to get tough on toxic chemicals and work for consumers to ban the Hazardous 100+ from their shelves and create a healthier future for all! Check out how some of my fellow bloggers are getting involved too!